When it comes to dining, no matter the cost of the meal, millennials place a premium on overall experience and that includes comfortable, well-appointed spaces, say marketing analysts. 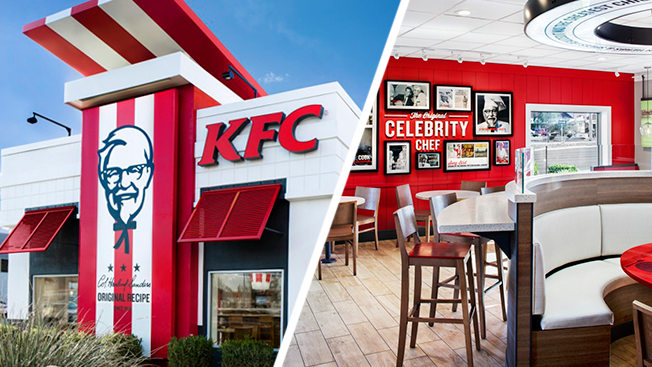 Having seen the steady rise of fast-casual competitors like Shake Shack and Panera Bread, legacy fast-food chains like KFC, Arby's and Taco Bell now are busy sprucing up their decor. "Good design is no longer reserved for high-end experiences," said Susan Cantor, CEO of Red Peak Branding. "Consumers care that they're in a pleasant, well-designed, clean and beautiful environment. When it comes to fast food, reliable food and quick service are no longer enough to satisfy millennials," said Lori Gross, executive director of strategy and growth at Landor. "It's about curating the whole look, tone and feel: all the touch points that will capture the consumer," she said. KFC's first redesigned restaurant, which opened in October 2014 and was designed by FRCH Design Worldwide, featured red and white pinstripes, an ode to KFC's bucket from the 1970s, on both the exterior and interior, with a large rendering of Colonel Sanders prominently featured on the front of the building. The chain has redesigned 100 restaurants so far, and it plans to redesign 70 percent of its U.S. restaurants in the next three years. "We want to recommit to our roots and engage consumers through our interior and exterior design," explained Brian Cahoe, chief development officer at KFC. "We're pleased with the sales lift we're getting so far from the remodels, and they're beating our expectations." Since the stores were redesigned, KFC had 3 percent store sales growth, per the chain. Arby's, which remodeled 179 of its U.S. restaurants in 2015 and expects to remodel an additional 225 this year, has seen a 15 percent sales lift from its redesign. 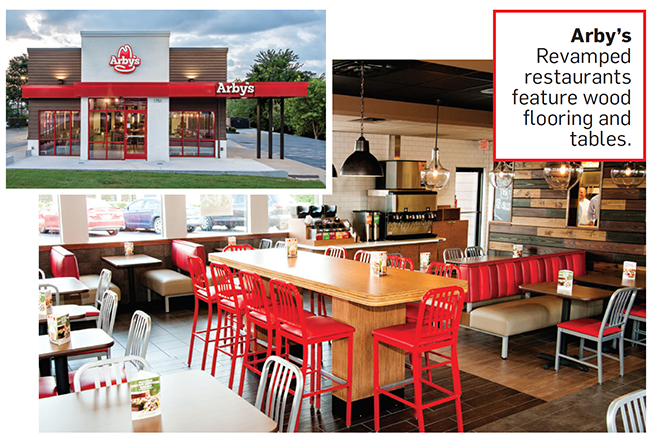 The new look, which features wooden floors and paneling and the brand's signature red seats, helps unify design across the 50-year-old chain's restaurants, said Greg Vojnovic, chief development officer at Arby's. "We had an aging asset base, and it was time to change it," he said. "Design really helps with your positioning and helps you appeal to guests who might not consider you otherwise." He added that overall guest satisfaction often is tied to the look and feel of Arby's restaurants (not to mention a new and improved menu). "When we have bad guest satisfaction scores, it's primarily a reflection of how poor our restaurants look," he said. "Our food and crew are great; fixing the restaurants is the easiest thing to fix." Taco Bell is in the process of updating its look as well. 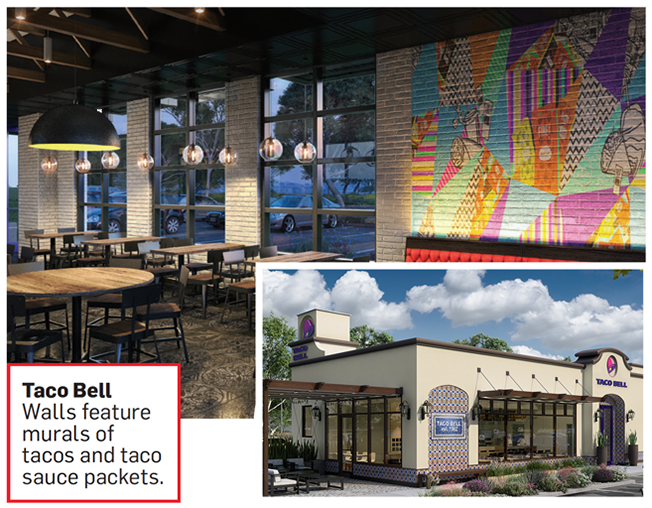 In May 2016, the chain began testing four new design concepts with gray brick walls, chalk renderings of tacos, and pink, purple and orange murals of taco sauce packets that will later be installed in Taco Bells across the country. "Some of our restaurants are dated, so it behooves us to update and modernize," said Marisa Thalberg, CMO of Taco Bell. "It's about bringing the brand's DNA and its best self forward. It's an opportunity to make our dining rooms great places to hang out and stay, and make it just as compelling as going through the drive thru." As fast-food chains revamp their menus to adapt to changing consumer tastes, revamping their restaurants makes sense, too, noted Diana Kelter, food-service analyst at Mintel. "Seventy-six percent of consumers say that fast food has gotten better over the years, and you don't want to serve innovative food in an establishment that looks the same as the place where people had their birthday parties at 5 years old. If they're innovating their menu, they want the overall experience to reflect that," she said. Kelter expects the trend to continue. "Concepts that were once associated with unhealthy food are all getting a makeover," she said. "We're seeing food courts and airport food get elevated, and we're going to continue to see this level of innovation in the fast-food space."